One of the easiest and most convenient ways to ensure the safety of workplace and home is by installing high tech camera and surveillance systems. Using the latest technology, the cameras can be installed and the place can be monitored without any hassle. There is a wide range of camera and security systems available in the market depending on your need and requirement. One of the best and most reliable types of security systems available in the market nowadays is YI 1080p Home camera Wireless IP Security Surveillance system. The surveillance camera offers full coverage in crystal clear image along with 4X zoom which enables focus on even minute details. With wide angle coverage, full HD resolution and f/2.0 aperture, it ensures complete security of your home and workplace. It sports 112° wide angle lens and bi-directional rotation range which enables capturing complete panoramic scenes in HD. It is equipped with advanced and latest technology with 1080p High definition resolution that gives crystal clear, crisp and digitally noise reduced visual images. The glass lens integrated into the YI surveillance camera is of superior quality and resistant to environmental damage. It gives crisp and clear 1080p HD quality image. The alert system is extremely important and here it is backed by the advanced baby crying technology. 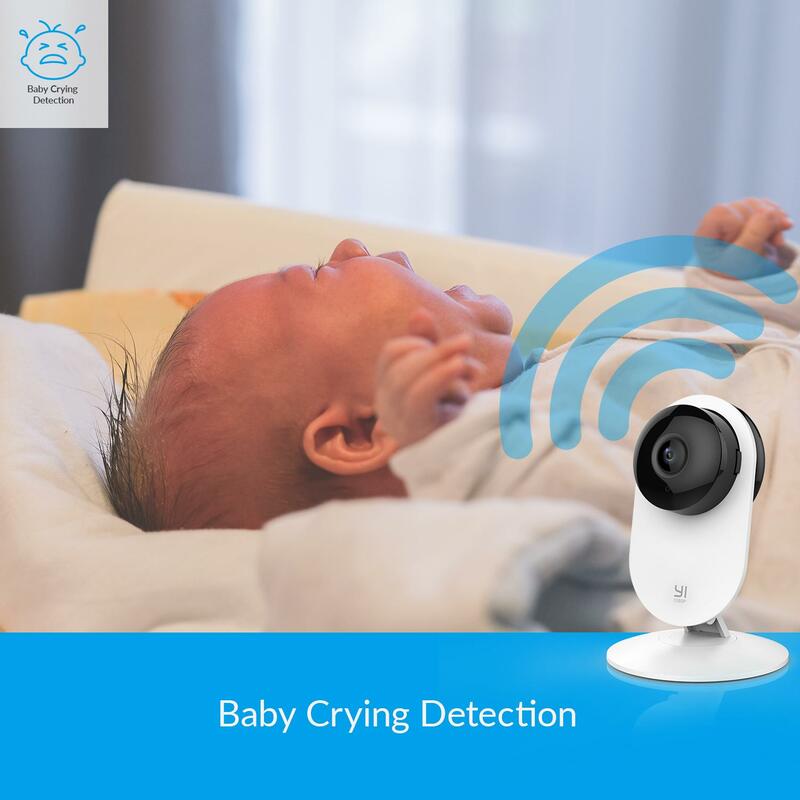 The baby cry sound can be picked by the surveillance camera from within 5 meters away and sent in a 6-minute video clip. The alert is being sent to you at first cry of your baby and alert is sent to your phone. What good is a surveillance system without advanced night vision system? The wide angle lens along with advanced night vision setting with 940 nm non-invasive sensor allows the camera to detect motion and capture footage even when it is pitch black. The smart motion detection system helps in accurately detect movement with help of its advanced motion computation algorithms. When it comes to installing surveillance and security camera system, it is important to keep the data secured and safe. The all new YI cloud use 2048-bit RSA private key for YI cloud service exchange and enables complete and safe compression of data. The encryption helps in protection of the data before being uploaded to cloud. For highest level data protection support, the encryption key is periodically updated. With the help of two ways audio system, the surveillance system helps you keep your loved ones secured and alert and give them company with your own voice. It has an inbuilt microphone along with speaker that provides clear 2-way Audio conversations which enable you to initiate a smooth conversation anytime. The YI home app comes with many customizable features which are of great assistance and convenience. It includes multiple features like define activity zone, alert schedules, camera sharing, motion detection sensitivity alert frequency, Night Vision IR lighting controls etc. The coverage area can also be expanded with help of the apps. The YI Home can be monitored and controlled with help of one convenient app which gives user-friendly, powerful and intuitive user interface to customize settings. The YI Home surveillance camera provides high-end protection and gives to videos with optional PIN code system. To store the videos, it supports 8 to 32GB microSD card in the FAT32 format. The 8GB SD card is able to record up to 18 hours of video footage. The first hour of the video is automatically deleted when the card is full and it continues recording hence forth. 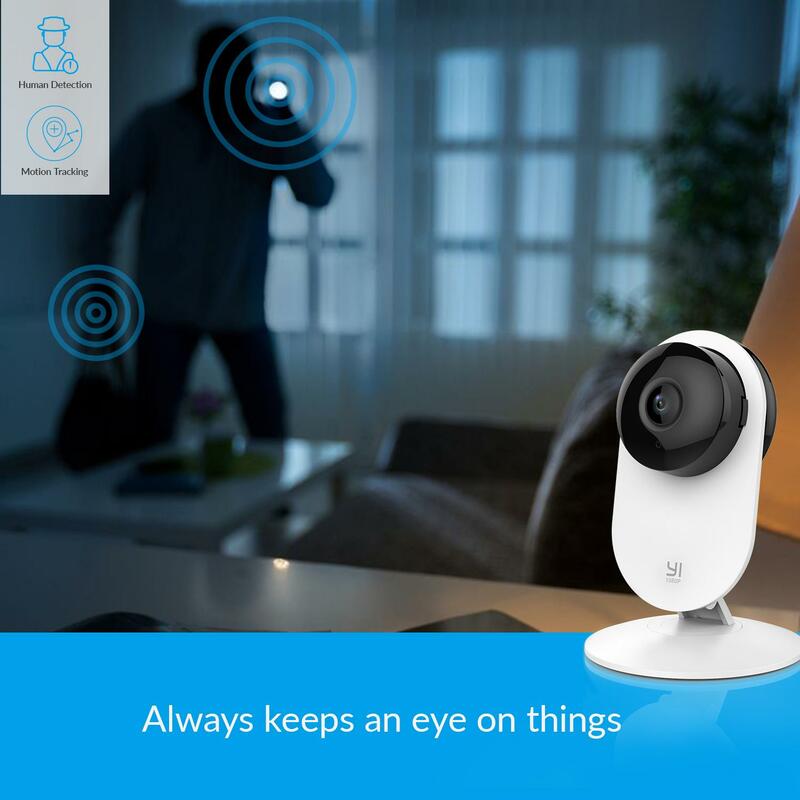 The YI Home security camera system can be connected via Wi-Fi which helps in accessing the camera with YI app on mobile or PC anytime, from anywhere. The YI Home system has inbuilt 802.11 b/g/n 2.4 GHz Wi-Fi connectivity and support system. 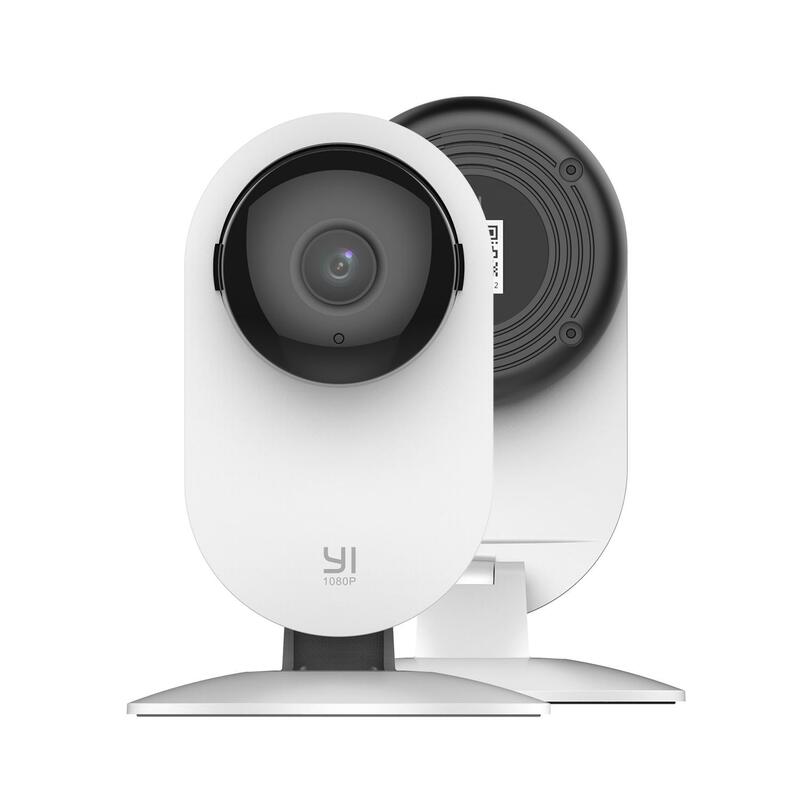 The cloud connectivity secures all the videos and with YI Cloud standard plan, one subscription can support up to 5 home or dome cameras. It is available in white color with the camera lens and frame in black color. The weight of the item is 4.8 ounces while the shipping weight is 94 ounces making it extremely light weight and easy to handle. The dimension of the product is 3.1 x 1.3 x 4.5 inches in terms of length, breadth, and height respectively. The image rendered is in 1080p HD resolution. Overall, the product is highly efficient with high-end features and tremendously advanced technology additions. It gives great performance and available at an affordable price completely worth it. Let us look us at some pros and cons for better clarity. The motion sensor and night vision of YI home camera are phenomenal as it helps in capturing clear images even when it is pitch dark. Cry baby sensor which traps child cry and sends an alert to your phone making you aware of the situation. The slightest and most friable motion and movements are even tracked by the camera with help of motion sensors. It is an advanced feature which is absolutely worth the camera. It offers wide angle frame along with panoramic view capture with the gyroscopic support by simply moving the camera left and right. The camera lens provides high end, crystal clear and crisp photos in 1080p HD resolution along with 360 degrees of visual range. The camera system is great as it is incorporated with advanced noise reduction filter and facilities two ways audio with inbuilt microphone and speaker system. The camera memory is limited to 8 to 32GB SD card and in order to continue recording, the first hour of recording is always deleted when memory is full. With so many apps and features, the use of the device becomes slightly complicated and also the apps at times come with multiple advertisements. It is complicated to troubleshoot the system on own due to its complicated technical aspects. However, considering the safety and security point of view, YI 1080p home camera is a good and safe product overall which helps in safeguarding and securing your home and office. Do take a look at all the features and things of the system to make the best use of it. It is one of the best security and surveillance cameras in the market.